Martha Garcia submitted this one. 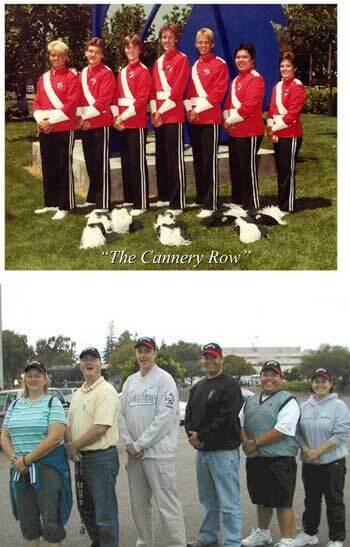 "Attached are two photos of the 1984 Santa Clara Vanguard pit. One is our formal group photo taken in June 1984, and the other is our 20th reunion photo taken in June 2004. All but one of us were able to make the reunion weekend, which included a BBQ with our spouses and kids, as well as a day trip to San Francisco, and culminated in our collective attendance at Vanguard's Pacific Procession competition in Hayward, Calif. "We were lucky to meet with the SCV 2004 pit, although it was pretty scary to find out that some of them weren't even born yet when we marched! It was a wonderful experience to hang out again, and while we hadn't really seen each other in 20 years, we are committed to keeping in touch from now on on a regular basis. Although we're older and very distanced from our time in drum corps, we still have a very deep love for one another that will never go away. Competition aside, lifelong friendships are one of the things that makes drum corps so beautiful! "From left to right: Kirsten Swanson, Jim Apple (missing from 2004 picture), David Bakken, Mike Wells, Mark Stepp, Tony Rogers, Martha (Leeson) Garcia." Thanks Martha!